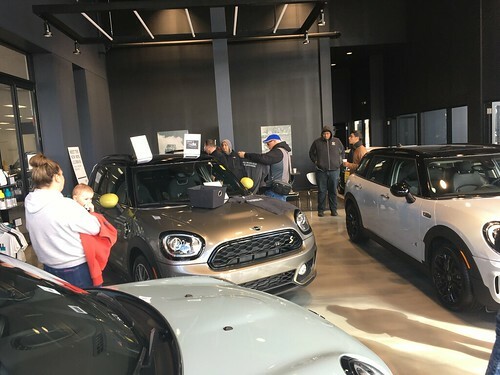 WRAPUP: Perfect weather for a perfect MINI event.. We had 10 MINIs meet up at Knauz MINI and caravan out to Milwaukee to join up with 25 or so additional cars, about 75 people total. Everyone drove into the park together, and settled in after some re-positioning from the friendly parking lot staff. We had some visting time and a fantastic catered meal for most of us, and a few packed their own for tailgating. We headed into the game, and the Cubs even won with a late in the game score of 1-0. Huge thanks to Theresa and Wade for working on all the arrangements for such a wonderful day, Rivers Edge Catering for the great food, and to Knauz MINI for hosting the Chicago meetup location. Here are the Chicagoland meetup details for the Cubs and Brewers Baseball game on Saturday September 11th. WHO: Anyone participating in the baseball game event or looking to take a group drive to Milwaukee area. WHAT to Bring: A full tank of gas, sunscreen, bug spray, chairs for tailgating, optional FRS radio tuned to Channel #1 subchanel #1, your favorite MINI or baseball clothes, and a smile! We will provide the Milwaukee meetup location as soon as we get details. Most of our family is going.. See you there! Please contact us with any questions or comments. MINI smiles!